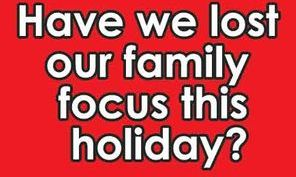 Have we lost our family focus this holiday? Last month we celebrated Christmas, but I bet a lot of people my age, baby boomers, will be thinking about how much more fun it was when we were younger than it is today. Christmas was a better holiday then because so much have changed since, not only in how we view the world but in how we view the holiday. I have a special fondness for Christmas, because my parents originate from the Holy Land. My dad is from Jerusalem and my mother is from Bethlehem. My mom worshipped at the Church of the Nativity, where Jesus was born. And my father worshipped at the Church of the Holy Sepulchre where Jesus was crucified and entombed. Theirs and my ancestors lived in the Holy Land for generations, as far back as records allow us to look. So it is special, at least for me. There was a time when celebrating Christmas was a respectful event filled with a focus on the family and on our faith. Yet these days, the focus has shifted to a strategy for others to profit. It’s all about making money. It’s all about going to the store and spending our money. And it is all about possessions. I think sometimes we forget that Christmas is all about pausing from our life during the rest of the year when we focus on working, earning money, paying taxes, and paying the bills to focus on our families first and foremost. It’s also a time to focus on our faith. It doesn’t matter whether we were Christians, Muslims or Jews. The truth is most Muslims and Jews have the same deep feelings for their own religious beliefs and importance to family. I think they understand how the Christmas Holidays are not only a symbol for Christians but also for them, too. Christmas is a reminder that we can all celebrate our religious holidays and use those holidays to energize our commitment to our families. I know because my wife and son are Jewish and Christmas is more of a season for them when families come together. They just finished celebrating Hanukkah, the eight-day “Festival of Lights” that commemorates the rededication of the Second Temple in Jerusalem. The story of Hanukkah is included in the Old Testament that Christians share. Muslims also enjoy a holiday season, although the timing comes sooner in their observance of Ramadan, a month-long period of fasting in which they commemorate the first revelation of the their religion, the Quran. Their faith recognizes the same biblical history and prophets of Jews and Christians. What brings Christians, Muslims and Jews together os that we all have our holidays of faith and we are all free to worship in our own ways. They are reminders to all of us that while we are different, we are similar, too, in many more ways than we think. These holidays symbolize our faith, and are supposed to be the lynchpins of family. That’s what the holidays mean to me. Family. When I was young, the Christmas Tree and even the presents were not the focus but rather a part of the family gathering, given as a means of strengthening the family. We didn’t look at others as being different. We looked at others as being the same. They shared the same experience of family-focused gathering through their faith, too. These days, the focus seems to have shifted to the money, the spending, and the “gifts.” It’s all about profit. We all need to change that. Instead of spending all that money on gifts, spend more time with your family. I can promise you that investment will bring you more than the abundance of gifts that often end up gathering dust in a closet. Merry Christmas, everyone, whether you are Christians, Muslims or Jews.